Just before the uprisings now known collectively as "Arab Spring," I took a short trip to Casablanca, the wealthiest and largest city in North Africa. And there I had a vision of the future. If you take away the future, what makes Japan different? In a word, history. The present is a moving boundary, travelling from the past into the future - what lies behind it is history, and the further it goes, the more history we have. When we try to peer into the future to see where we're going, as often as not we're peering into a driver's mirror, watching the past unroll behind us. To understand a culture's future you must look at its history - for the history people have experienced defines the future they want. I would argue that the opposite is true for Casablanca, a city whose past is incredibly fascinating, but whose future promises to be weirder than anything you can find on the streets of Shinjuku or Akihabara in Tokyo. Casablanca, an ancient port town, exists at the crossroads between Europe and Africa. It is a crazy, sprawling city, home to nearly 3 million people, and growing fast. Walking through the streets as I did, you would find yourself passing Apple stores and cafes, mosques and parks. The juxtaposition of shops, parking lots, and places of worship felt a little like walking through an American city, where churches and malls exist side-by-side. On the streets, people dress in jelabas or designer jeans, depending on their inclination. Some women cover their heads modestly and some do not. I heard my first call to prayer when I visited the city's Hassan II Mosque, a super-sized, ultra-modern mosque on the water near the old, walled part of town called the Medina. From loudspeakers in the mosque and out across the city, you could hear the amplified chanting - and nobody really seemed to pay attention. A woman in a blue velvet jelaba posed in front of the mosque during prayers, scolding her husband in Arabic and gesturing at him to point the camera at her and get a good snapshot. A bunch of teenagers lazed on their motorcycles down by the water at the mosque's edge, smoking and joking around. This was a city that honored its history but did not seem burdened by it. And the future stared down at me everywhere I went. When I walked from the Media to the Hassan II Mosque, along a fat, freshly-surfaced highway that edges the ocean, billboards hammered to a long fence promised luxury living in a soon-to-be-finished Marina district. Massive buildings were under construction: Soon they would be full of condos (with yacht parking), an exercise center, and a shopping district. In the downtown area, billboards advertising Android phones dominated the skyline. Everywhere I looked, buildings were going up. My traveling companions and I hired a guide one day, to show us around the tiny, winding streets of the Medina. "This is an expensive part of town," he told us, as we watched kids rushing to school past a man selling horse meat from a stall. "Don't go to the south part of the city, OK? That's not a good place for you guys." He meant well, and I think he took us for a more gullible bunch than most because of my weird enthusiasm for taking pictures of shop signs instead of "historic buildings." But we took his advice - we'd seen the shantytowns that clung to the outside of the Medina's high walls, fingers of crumbling wood and stone that reached out toward the improbable glossiness of the Hassan II tower. As if to emphasize our guide's point, most paper maps for sale represented the southeastern city as a skeletal outline of unmarked streets. We were outsiders, not just because we were Americans who spoke no Arabic, but because we had money. Still, it was an outsider status we shared with many natives of Casablanca, a city where one of the suburbs is called California and is full of malls and tech campuses. Casablanca is a city riddled with poverty, but also with wealth. I doubt that many people who grew up in the Medina ever walked into the south side of town either - just the way rich people in San Francisco may live in the city for decades and never set foot in Bayview Hunters Point, where all the housing projects are. Though many tourists come to Morocco to see history in cities like Fez, I was hungry to see the future in Casablanca. I saw it in the cybercafes with their hodgepodge of Arabic, French, and English signs. And I saw it on the streets, where people from many cultures threaded their way between new buildings and old, building a wall around their new Marina district to match the wall around the old Medina. I had read before coming to the city that knowing French would help me get by, but it didn't. Sure, people speak a little French, but not gladly. French is part of their colonial past; Arabic is the future. I believe that we will have stepped further into the future when more places on Earth are like Casablanca, a mix of secular and traditional, as well as African and European. Every building, no matter how ancient, is forested with satellite dishes, their bodies bolted to centuries-old stone and their faces looking upward into space. If you want to see how the world is going to develop, Casablanca is one place to look. Flip through the photo gallery above to see what I saw. My editor's column runs whenever I damn feel like it, and you can read other installments here. A giant Android ad loomed over the downtown. From Casablanca's highest building, the Twin Center, you can see all the satellite dishes and antennae on everybody's roofs. Of course there's an Apple store. More ads for technology companies. In a mall in the suburb called California, you can shop at the "Gab.' The logo is in the same font as the Gap logo circa 1980. A Casablanca superstore has everything you want, from brie and dates, to computers and Barbie dolls. In the superstore, they sell spices in bins designed to look like the ones where people sell spices in the old Medina's traditional spice market (see next picture). Here is the traditional spice market in the old Medina. In the mall superstore, you can see a simulation of this area. It's just like in Western supermarkets where fruit is put out in baskets, as if trying to imitate the way farmers would have sold their fruit in an earlier era. This is the new Marina development, across the street from the walls of the Medina. In the Medina, a machine service shop. A street scene in the old Medina. Women get water from public fountains in the Medina. One wears a jelaba, another is in sweats. The luxurious Hassan II tower at the mosque, which holds over 30 thousand people. Tourists come from all over North Africa to see it. Buy Nokia! It's the future. 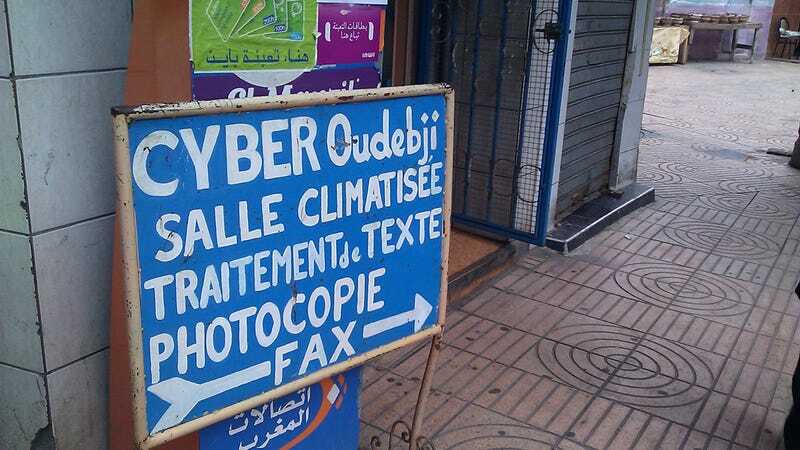 A store in the old Medina offers photocopy services. In the suburb called California, a giant campus for high tech companies sits by the edge of the freeway. Mobile phone services in the Medina. A store in the Twin Center mall.